If you like my OOTD’s, you’ll love this. January 18, 2016 .Reading time less than 1 minute. February 1, 2014 .Reading time 1 minute. Have you ever smelt a scent and thought of someone instantly? Is there a certain sent that brings back so many memories it’s almost overwhelming? For me, Coco Chanel Mademoiselle rekindles memories of high school. Almost every girl in my school started wearing it by the end of my sophomore year. It makes the perfume so much more desirable. It’s important for a girl to have her own personal scent. It may take some time to find but she’ll know it once she finds it. It’s that perfume that smells best on her. It’s the one she’ll get so many compliments on and feel the most confident while wearing. Most importantly, it’s her in a nut shell. Different perfumes represent different things, which can be very confusing when trying to find the one. 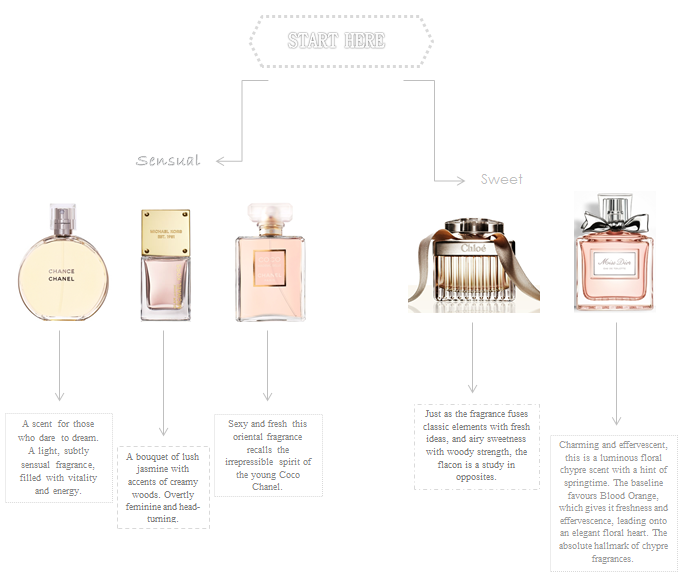 Luckily, I’ve made a chart that will make your life easier when trying to find your perfect scent.